Winter can be tough...I mean, really tough. Season depression is a thing y'all. It took me awhile to get it because I absolutely love rain, snow and a heavy dose of @karlthefog. The thing is though, when the sun goes down on you and the sky goes dark before you leave work...it can be a little hard to feel absolutely cheery. When the sky falls dark before 5 p.m., it can be hard to summon your sunniest mood. The good news? You can totally crack the code on the winter blues and turn that mood around way before Spring rears it's head back into your life. These days, everyone wants to diagnose you (*cough* Web MD *cough*). A popular answer when winter blues comes up is to get your vitamin D checked. Sure, it's always good to make sure you're healthy and giving your body the vitamins it needs to be your best self, but try not to look for a scapegoat that comes in pill form when you don't need to. If you have any pigmentation to your skin, your vitamin D levels are probably low. There are scientific studies that have ever shown taking vitamin D helps winter depression. Having low levels of vitamin D increases the risk of depression, but only for people with a prior clinical diagnosis of depression. This is a two-pronged issue for most: gear and fear. “Gear” helps us feed our souls, while nature helps transcend any holiday materialistic guilt. 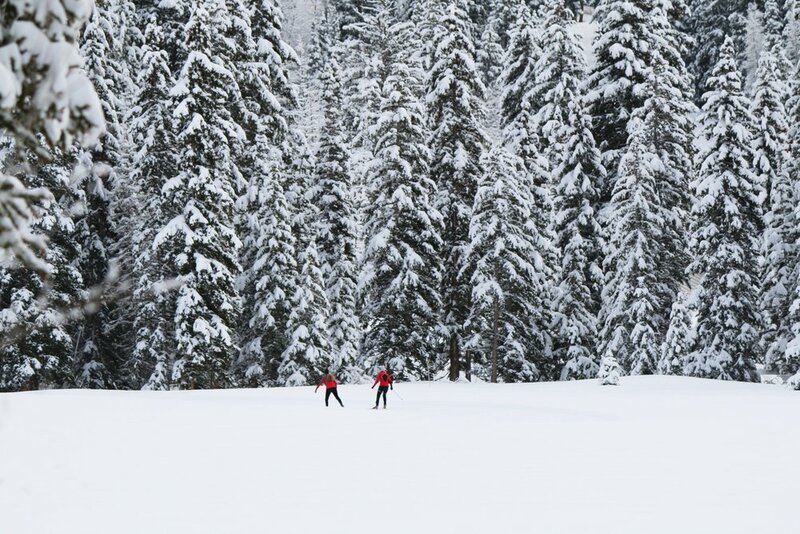 Deep in the forest with your snowshoes, you’ll be toasty with a base layer of silk and and a windproof shell. “Fear” usually stems from inexperience. Winter hiking, skiing hut-to-hut, carving big mountain turns in the fresh powder, and winter sports are super accessible. Grab some gear. Grab a guide or a lesson. And get active. You'll be happy you did. It’s dark out, so sleep more. It’s frigid, so drink more hot soups, broths, and tea. Winter is a time of rest and reflection, a season of long reads by the fire, and long talks. . Other seasonal perks? Hit the sauna to melt the bone-chill. Heck, cozy up in from of a fireplace (Don't have one? Ask a friend if you can come over.) and sing all the winter carols your heart desires. Lower moods often mean eating all the carbs in sight. And even for loyal adherents of a low-sugar lifestyle, well, holiday cookies and cornbread stuffing are freakin' tempting, amirite?! Spend a moment and contemplate your winter rainbow: orange squash, purple yams, and crispy Brussels sprouts. These colors represent different phytonutrients that influence our cells and DNA in health-promoting ways (you know, battle inflammation, squelch free-radicals, etc.). Get more seafood, too. Long-chained omega-3s—the kinds that are concentrated in wild salmon, anchovies, and mussels—modestly boost mood in trials for clinical depression. Stuffing your face with macaroni and cheese sounds so good when it's snowing outside, but adding fresh veggies and protein to your diet won't just keep you lookin' your best...it'll help you feel the best too. Unlike other forms of the blues (job blues, boyfriend blues, apartment blues) you can 100 percent escape the winter blues by escaping winter itself (The Canadians are notorious for this. Hellooooo, Snow Bunnies!). Plan a quick trip that fits your budget to someplace fun and warm. Think about the weeks you tend to struggle most and book it STAT. It’s winter. Put a humidifier in your bedroom or an essential oil diffuser and wash your hands more. Stock up on Chapstick and moisturizer. Deal with drafts in your living space. Winter is here—and doing what is in your control to get sick less and care for the realities of winter will help keep you well. People wait until the 11th hour to get help. If your mood and energy are significantly slipping, or maybe you feel sleep-deprived, irritable, and hopeless, or you just aren’t enjoying any of your regular activities, remember: Seasonal depressions come in many stripes. You don’t need to be clinically depressed or hitting rock bottom to merit some assistance getting back on track. Expert advice could come from a therapist, health coach, psychiatrist, or psychologist, or your teacher or religious leader. Just ask. Learn more about seasonal affective disorder from the American Psychiatric Association.